If you think the holidays are stressful, your dog might also be feeling a little anxious! Changes in your dog’s routine could make him feel nervous, and it doesn’t take much! Something as simple as rearranging the furniture to make room for a Christmas tree might seem odd for your dog. It can also be stressful for our dogs when friends and family visit during the holidays, especially if they stay for a few days or if they bring their own pets! 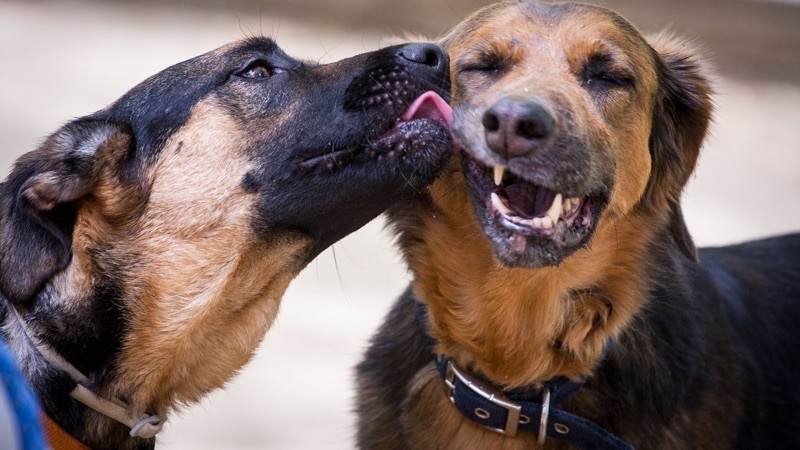 This post is sponsored by Ceva Animal Health, the maker of ADAPTIL® for dogs, a product designed to reduce a dog’s anxiety using dog appeasing pheromones. If you are interested in trying ADAPTIL® for your dog, we have a giveaway at the end of this post! All you have to do is leave a comment and you’re entered! Update: The giveaway has ended. ADAPTIL® mimics the natural dog-appeasing pheromone dogs know from birth that can help them feel safe and secure in their environment. Read more about ADAPTIL® here. 1. Don’t force your dog to interact. If your dog wants to interact with your visitors, then great! However, don’t force it. You know your dog best and how he feels around strangers. Likewise, if your visitors bring their dogs along, slow introductions are usually best. I highly recommend introducing the dogs outside on “neutral” territory or even heading out for a walk together right away. Head-on greetings in tight quarters like in the doorway can bring out protective behavior from dogs, especially with a lot of excitement going on. See my post: How to introduce dogs. 2. 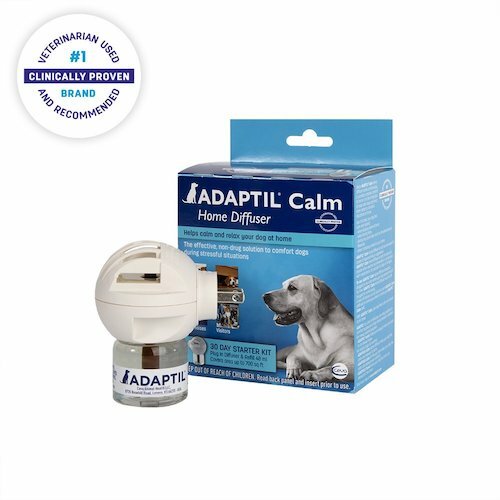 Use ADAPTIL® for Dogs to help your pup feel calm. ADAPTIL® is designed to help dogs feel more secure by mimicking the natural dog-appeasing pheromone they know from birth. 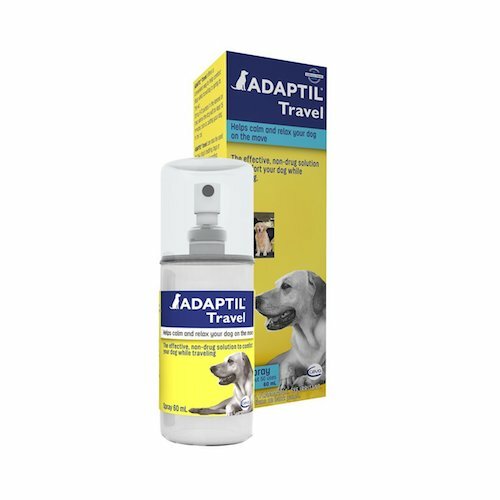 ADAPTIL® is available in several formats including a ADAPTIL® Calm On-The-Go Collar, a ADAPTIL® Calm Home Diffuser or a ADAPTIL® Travel spray. 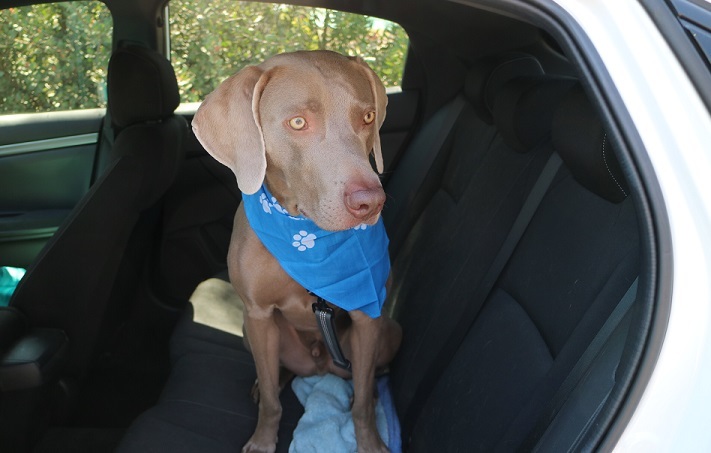 The spray can be used on a bandana or on your dog’s bedding. 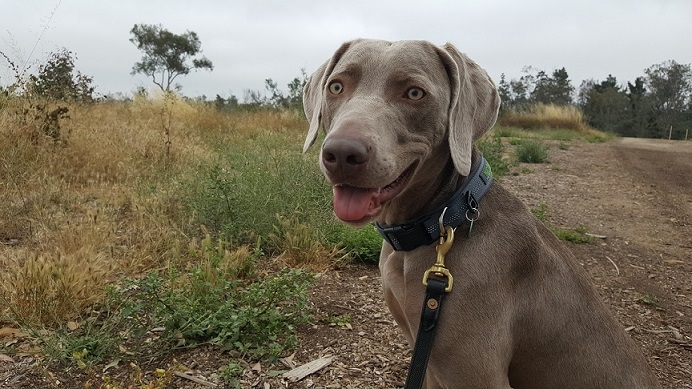 Because ADAPTIL® is designed to help dogs feel calmer, it should reduce stress-related behaviors like licking, barking, howling, destroying property or having accidents. It is available through various veterinarians’ offices, PetSmart and Amazon. There is also a version for cats called FELIWAY® for Cats that mimics the natural cat facial pheromone used by cats to mark their territory as safe. 3. Provide your dog with his own space. Your dog might love to be around all the commotion! However, if he seems stressed out by all the new people around, I recommend you provide him with a quiet area to decompress. For most dogs, this could be as simple as giving him time in his crate or on a dog bed in a quieter corner of the house. You’ll want to have the crate or bed in a place your dog is comfortable such as your bedroom. Your dog might have an easier time relaxing if he has something to chew on such as a bully stick or a Kong stuffed with peanut butter. You could also play some relaxing music to help drown out the extra noise. And like I mentioned above, this would be a good time to use the ADAPTIL® Calm Home Diffuser or ADAPTIL® Travel spray. 4. Explain to friends and family how to interact with your dog. Most people love animals and will want to interact with your dog. 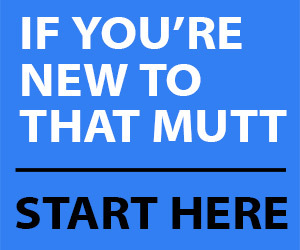 This is usually fine, but if your dog is somewhat shy around new people or if your dog is working on manners like not jumping, it’s best to tell people this in advance. Make time for your dog’s usual exercise routine. Heading out for a long walk or whatever you normally do will give your dog a way to decompress and burn energy. The less pent-up energy your dog has, the easier it will be for him to relax! Try to head out for a long walk each day before your visitors arrive and to continue your walking even when you have family staying with you. Update: Congrats to Michele W. and Denise K.
To enter, all you have to do is leave a comment below to let me know why our pet could benefit from these products. Are the holidays stressful for the pets in your family? I’ll choose the winners at random on Tuesday Dec. 11 and announce them here plus notify the winners by email. Could your dog or cat benefit from ADAPTIL® or FELIWAY®? Please share this post if it will help a pet you know. Interesting. Especially the home diffuser. What does it smell like to humans? It doesn’t have a scent to us, at least not that I can tell. My 5 month old puppy has so much stress going for car rides. Nothing seems to help. The poor thing drools heavily and often will vomit. She loves the places we bring her to, just not the means of getting there. Would love to win and try this. 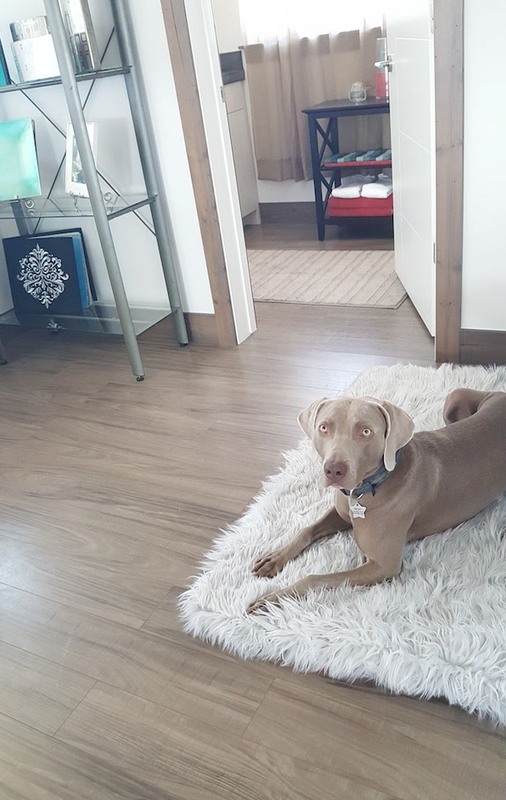 Have a dog with anxiety issues and would like to see if this would help when he is in his crate. We have an older, high stress Boston that is prone to seizures. We have tried many products but had not heard of ADAPTIL until reading this blog. Very interested in trying this as we are expecting quite a bit of chaos in our house over the holiday season. Thanks for the information! I have a little Border Terrier girl and she us so nervous around visiting dogs. I think Adaptil would calm her and help her to be less reactive and be her true lovely happy self. Bring it on my dog so deserves it! I have a rescue dog who has major trust/stress issues meeting new people. I’ve tried thunder shirt and hemp treats, but they do not work for her. I would love to try this so she has a great time with our friends/family. We are willing to try anything to calm our 6 yr. old Doodle. He continues to be very unruly with visitors. I have a border collie with many areas of anxiety. I would love to try and use a natural calmer on her or diffused near her. Our 6 year-old Beagle, Charley, has terrible fear of thunderstorms. He wears a Thundershirt, but still shakes uncontrollably. I’m interested in seeing if Adaptil would help him. We have a 5 year old terrier mix that has terrible separation anxiety. He has to see me at all times or he gets very nervous. I just want him to be relaxed and happy!